Book Club was at our house this last week. I love to host the ladies. * They all come happy and ready for a nice evening out. The food was delicious (complete with baklava for dessert to go with our Middle Eastern theme), the conversation wholesome yet entertaining, and we all left feeling renewed and ready to appreciate life a little more. *Special thanks to my most awesome super-amazing husband that helped with the set-up, clean-up and kid care without complaint. What a great guy... thanks babe, you rock. 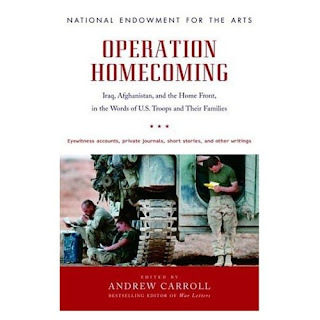 Operation Homecoming: Iraq, Afghanistan, and the Home Front, in the Words of U.S. Troops and Their Families by Andrew Carroll was our title this month. I have to admit that I did not get through the entire book - not even the first section. It wasn't for lack of interest - I just never made time to sit down and read this month - sad excuse, I know. The whole book is narratives of those that have served in the military and some of their family members' experiences. The few stories I read were very real and gave a great perspective for what our U.S. troops must endure in service for our country. It is not pro or anti-war as both sides are represented but not pushed upon the reader. And I'm told that it contains some graphic scenes and hard language - obviously, this is what to expect with war. I do recommend this book to adults. All the book club ladies that read this book gave it a thumbs up. They all agreed that it gave them a greater appreciation for our troops and for those loved ones they hold dear.